Slanted and Disenchanted: Matt Groening's new medieval sendup follows a hard-drinking princess (voiced by Abbi Jacobson) and her entourage, a personal demon (Eric Andre) and an elf (Nat Faxon). It's been almost 20 years since Matt Groening, creator of The Simpsons, has released a new show. He last did it in 1999 with his sci-fi comedy Futurama. But he says, it hasn't been all work since then. "I love playing," Groening says. "I love inventing worlds." As it turns out, Groening has been dreaming up a new universe almost all of that time. 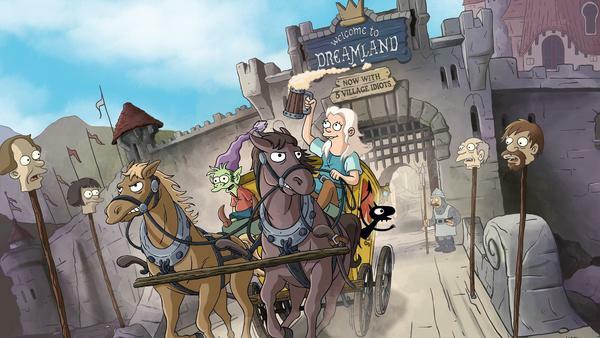 His new show Disenchantment is an animated fantasy set in the medieval kingdom of Dreamland. "Matt actually pitched sort of at least the basis for the idea of Disenchantment probably in the second or third season of Futurama," says Claudia Katz, an executive producer on the show. She also worked with Groening on Futurama. "You know, he really ruminates for a while." So I had to ask Groening myself: Why did it take almost 20 years? "Because animation is too darn hard to do," he says. "It doesn't get any easier too, the older you get, you know? You still — oh my gosh." But it wasn't just the usual amount of work involved in animating a show. With Disenchantment, he's trying a few different things. Katz says that Groening wanted his medieval world to be detailed. During development, he sent over packets of reference images to their animation studios, including stills from films like Akira Kurosawa's Seven Samurai. "Matt just kept going, no no no no no, it's gotta be a lot more cinematic," Katz says. "And we were like, no no it is cinematic, and he's like, no no, more cinematic." The result is the (somewhat dilapidated) kingdom of Dreamland. It doesn't look like any of Groening's other worlds. There are nods to The Wizard of Oz, Lord of the Rings and Game of Thrones. At the center of it is Princess Tiabeanie, who mostly goes by Bean. She's voiced by Broad City's Abbi Jacobson, and she is a rebellious teenager, resisting her father's attempts to marry her off. "I can get married or I can die," she ponders aloud while plummeting off a cliff. "This should be a harder decision." Bean is accompanied by a personal demon, Luci (Eric Andre), and an upbeat elf named Elfo (Nat Faxon). The trio quickly develops a scrappy friendship — which mostly involves late nights on the town and generally raising hell. A lot of the humor is trademark Groening, but there's much that sets this show apart from the rest of his work. For one thing, it's his first time working with a streaming service. Netflix dropped all 10 episodes on Friday. Groening says he had mixed feelings releasing years of work on a single day. But he is glad to be away from TV. "I've been working in animation now for 30 years on The Simpsons, which interrupts itself every seven minutes to sell you a series of breakfast cereals," he says. "And it's very pleasurable to ... be able to take as long as we want to tell our story — and to slow things down." Running two shows at once is a lot of work, but it can have its upsides. "I can tell the people at Disenchantment that I'm working at The Simpsons and the people at The Simpsons I'm working at Disenchantment and then I just go home," Groening says. Groening and co-creator Josh Weinstein took a different approach to writing Disenchantment, plotting it as a drama and then adding jokes. "It's a challenge to go for things that aren't funny," Groening says. "And we just riffed off each other and came up with an overarching epic tale and we know where we're going with this. We're going to take this thing really crazy places." And that's the biggest difference between this show and the rest of Groening's work. During our conversation, he alludes more than once to the existence of a big narrative riddle that lies behind Disenchantment and will eventually be revealed. The Simpsons, which has unfurled over three decades, has taken a different approach, engaging in a social commentary that has sometimes changed the times and sometimes battled with them. Groening notes that after such a long time on air, "The Simspons has been taken to task from so many directions, and it's always fun to annoy a certain number of people." Matt Groening, creator of "The Simpsons," released a new show this week. It's called "Disenchantment," and it's an animated fantasy set in the medieval kingdom of Dreamland. As Elizabeth Kulas reports, while there are similarities to his earlier shows, with "Disenchantment," Groening is trying something quite different. ELIZABETH KULAS, BYLINE: It's been almost 20 years since Matt Groening released a new show, which he last did in 1999 with his sci fi comedy called "Futurama." But he says he's still having a lot of fun. MATT GROENING: I love playing. I love inventing worlds. KULAS: And it turns out that Groening has been inventing the universe of "Disenchantment" for almost all of this time. CLAUDIA KATZ: Matt actually pitched sort of at least the basis for the idea of "Disenchantment" probably in the second or third season of Futurama. You know, he really ruminates for a while. KULAS: Claudia Katz is an executive producer on the show and worked with Groening on "Futurama." So I had to ask Groening myself, why did it take almost 20 years? GROENING: Because animation is too darn hard to do. It doesn't get any easier, too, the older you get, you know? You still - it's still - oh, my gosh. KULAS: But it wasn't just the usual amount of work involved in animating a show. DAVID HERMAN: (As The Herald) Four o'clock and all is well. Actually, well is a bit of an overstatement. KULAS: Groening pushed for his medieval world to be extremely detailed. UNIDENTIFIED ACTOR #1: (As character) Morning, Princess. UNIDENTIFIED ACTOR #2: (As character) Lovely day, miss. UNIDENTIFIED ACTOR #3: (As character) How's it hanging, Princess? KULAS: He sent over packets of reference images to Katz's studios, including stills from films like Akira Kurosawa's "Seven Samurai." KATZ: Matt just kept going like, no, no, no, no, no. It's got to be a lot more cinematic. And we were like, no, no, it is cinematic. And he's like, no, no, more cinematic. KULAS: The result is the kingdom of Dreamland. It's a little dilapidated, doesn't look anything like Groening's other worlds. There are nods to "The Wizard Of Oz," "Lord Of The Rings," "Game Of Thrones." ABBI JACOBSON: (As Princess Tiabeanie) I can get married, or I can die. This should be a harder decision. JACOBSON: (As Princess Tiabeanie) Look, I know I went a tad wild. KULAS: ...Resisting her father's attempts to marry her off. JACOBSON: (As Princess Tiabeanie) What do you expect from someone who's got no control over her own destiny? So I turn to booze, drugs and my evil little friend. ERIC ANDRE: (As Luci) Oh, my God, shut up. KULAS: That's Bean's personal demon, Luci, played by Eric Andre. And soon, they're joined by Elfo, voiced by Nat Faxon. He's an elf who's escaped his oppressively upbeat home town looking for new experiences. NAT FAXON: (As Elfo) Just once, I wish - I wish I could go somewhere where people are miserable. KULAS: The trio quickly develop a scrappy friendship, which mostly involves late nights on the town. JACOBSON: (As Princess Tiabeanie) This has got to stop. ANDRE: (As Luci) Oh, come on. You know you enjoyed it. JACOBSON: (As Princess Tiabeanie) (Laughter) Yeah. KULAS: A lot of the humor is trademark Groening, but there is much that sets the show apart from the rest of his work. For one thing, it is Groening's first time working with a streaming service. Netflix dropped all 10 episodes on Friday. Groening says he had mixed feelings releasing years of work on a single day, but he is glad to be free of the TV format. GROENING: I've been working in animation now for 30 years on "The Simpsons," which interrupts itself every seven minutes to sell you a series of breakfast cereals. And it's very pleasurable to be able to take as long as we want to tell our story and to slow things down. KULAS: Running two shows at once is a lot of work, but it can have its upsides. GROENING: I can tell the people at "Disenchantment" that I'm working at "The Simpsons" and the people at "The Simpsons" I'm working on "Disenchantment," and then I just go home (laughter). KULAS: Groening and co-creator Josh Weinstein plotted "Disenchantment" as a drama and then added jokes. GROENING: It's a challenge to go for things that aren't funny, and we just riffed off each other and came up with an over-arching epic tale, and we know where we're going with this. We're going to take this thing really crazy places. KULAS: And that's the biggest difference between this show and the rest of Groening's work. During our conversation, he alludes more than once to this big narrative riddle behind "Disenchantment." "The Simpsons," on the other hand, has been unfurling for 30 years. Sometimes the show has changed the times, and sometimes it's battled with them. GROENING: With "The Simpsons," we've been on so long, we've been taken to task from so many different directions. Then it's always fun to annoy a certain number of people. KULAS: But working in this new genre, Groening clearly has different ambitions for "Disenchantment." GROENING: The nature of the history of fantasy is it's always things are not what they seem to be. KULAS: And like a good magician, he ups the intrigue without ever giving too much away. GROENING: I issue this challenge. The very first thing you see in animation on "Disenchantment" gives a big clue as to what the nature of this universe is. That's all I can say. There's lots of secret clues and puzzles and even treasures - (laughter) no monetary value, but they're in there. KULAS: "Disenchantment's" first season is out now. A second season is expected out next year. For NPR News, I'm Elizabeth Kulas in New York. JACOBSON: (As Princess Tiabeanie) Gah, quit judging me, Dad. Transcript provided by NPR, Copyright NPR.